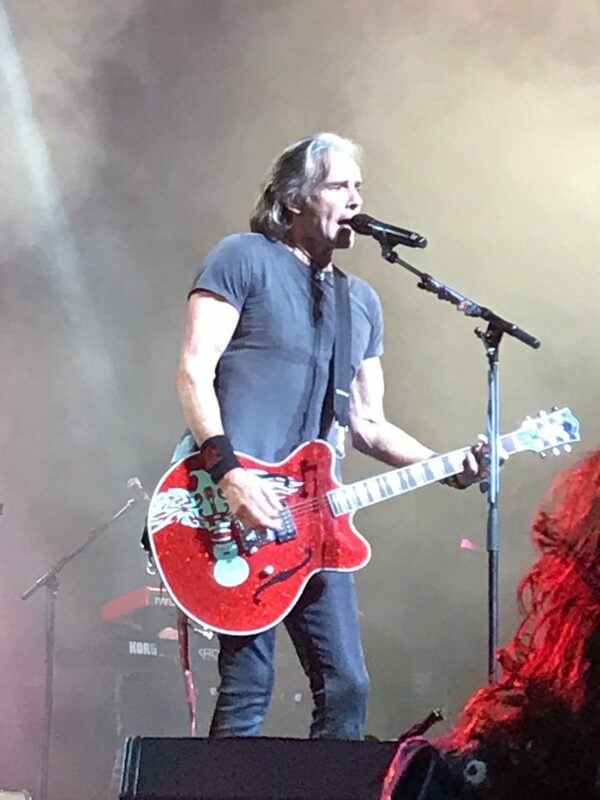 Last night we saw the very talented, Grammy-winning, slim, 69-year old Rick Springfield, live on stage, from the third row. He began on time and played about a dozen different colorful guitars for two and half hours, non-stop. It looked like quite a workout. He told stories about some of the songs. He invited two 10-year old girls up to the stage to sing a line of a song with him (Don’t talk to strangers). 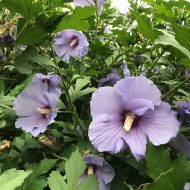 He used several bouquets of roses given to him by adoring middle-aged women as guitar picks, covering the stage with pink and red petals. 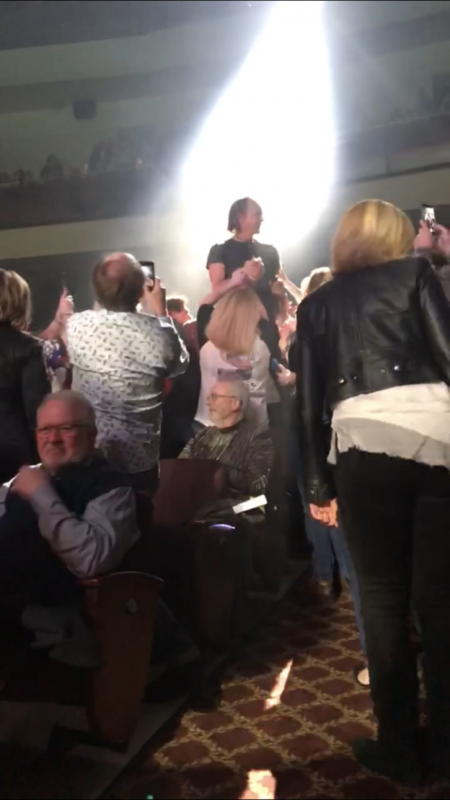 The most “rock star” thing he did, besides throwing guitar picks to the fans, was come into the audience, and stepping on the backs of the chairs, he made his way through the audience to the center of the auditorium, singing the whole time. The fans went crazy! He’s still got star power! 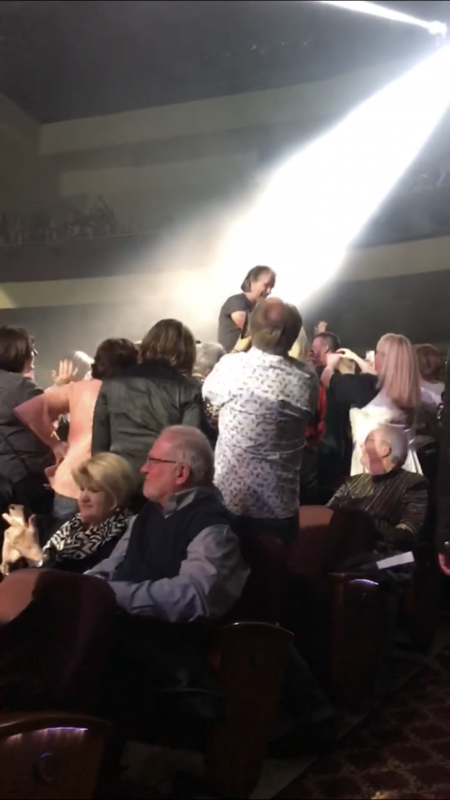 Rick Springfield ‘walking” thru the audience. Richard Lewis Springthorpe (born 23 August 1949) is an Australian singer, instrumentalist, songwriter, actor, and author, known by his stage nameRick Springfield. He was a member of the pop rock group Zoot from 1969 to 1971, then started his solo career with his debut single “Speak to the Sky” reaching the top 10 in Australia in mid-1972, when he moved to the United States. He had a No. 1 hit with “Jessie’s Girl” in 1981 in both Australia and the U.S., for which he received the Grammy Award for Best Male Rock Vocal Performance. He followed with four more top 10 U.S. hits, “I’ve Done Everything for You“, “Don’t Talk to Strangers“, “Affair of the Heart” and “Love Somebody”. Springfield’s two U.S. top 10 albums are Working Class Dog(1981) and Success Hasn’t Spoiled Me Yet (1982). I remember seeing him on General Hospital when I was in college. I never saw any other show he was on. I admit I only knew a few of his songs, yet now I have a new respect for him as an artist, showman, and über talented rock star. Long live Rock Star Heart Throbs!